United boss Sir Alex Ferguson has this evening received an honorary degree from The University of Manchester to mark his 25 years in charge of the club. The award also recognises his role in shaping Manchester’s worldwide reputation. 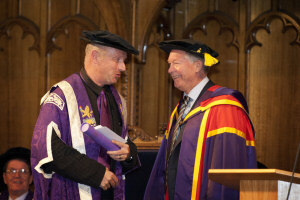 Sir Alex, 69, was presented with an honorary doctorate, the University’s highest honour. Sir Alex said: “I think it’s always nice to be appreciated and recognised, and getting this recognition is testimony to all the hard work that has gone on at Manchester United in the last 25 years, not just by me, but by everyone at the club. “The great part for me is still to be out on the field with the players and coaching them. As the game has changed, I have had to change with it; for example, sports science in the last decade has seen a phenomenal improvement and that has become a major development in the game. “I just don’t think about retirement any more, when you’ve been on the treadmill for so long, 25 years in my case, and my health is good at the moment, it’s just a matter of looking forward to being the manager of Manchester United, rather than worrying about Alex Ferguson. The University's Deputy President and Deputy Vice-Chancellor Professor Rod Coombs made the presentation - he said: “These two and half decades of the Ferguson era at United have coincided with – and been a big part of – the renaissance of this city. That renaissance has been manifest in industry, in commerce, in architecture, in the arts, in our University, and in sport. “Of course we are blessed with two great football clubs here, but today we are celebrating the achievements of one manager who has made a unique contribution at Manchester United, and through that, a unique contribution to the city of Manchester and its prominence in the world. The ceremony on Wednesday marked the University's Foundation Day. Earlier in the day, the University’s former Co-Chancellor and former CEO of Tesco, Sir Terry Leahy, gave this year’s Foundation Day Lecture entitled ‘A Revolution in Green Consumption’, making him the first non-academic in the University’s history to give the address. In his lecture on climate change, Sir Terry said consumers were helping to power a change towards a more sustainable future. He said: “There is plenty of evidence that consumer understanding is running ahead of government action. They see climate change not just in terms of a threat to our planet and way of life but directly to their children and grandchildren. They want to do something to stop it.